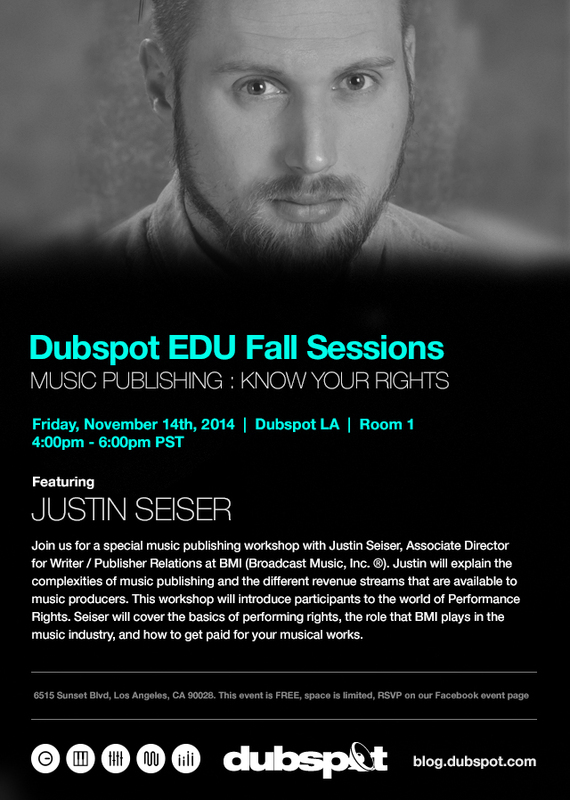 On Friday November 14th our Dubspot LA EDU Fall Sessions continue with a special EDU session that focuses on music publishing rights and royalties with Justin Seiser, Associate Director for Artist / Publisher Relations at BMI. If you are creating and publishing music, chances are that you’d benefit from a Performance Rights Organizations (PROs for short) who can get you compensated for having your music played, performed, or licensed. BMI (Broadcast Music, Inc. ®) is one of the biggest organizations available and we’re excited to have Justin Seiser, Associate Director for Writer / Publisher Relations join us to explain what a company like BMI can do for musicians and recording artists. This workshop will introduce participants to the world of Performance Rights and Seiser will cover the basics of performing rights, the role that BMI plays in the music industry, and how to get paid for your musical works.